It all comes down to common sense and good taste, according to the DMV. The DMV team in charge of approving California vanity plates has seen it all: vulgarities, prejudice, hostility, sexual innuendos and political statements. Any of these offenses could keep a license plate from seeing the road. The plate could be coded with numbers, acronyms or even be written in a foreign language. Submissions can include hearts, stars, plus symbols, hands and spaces. Plus, the granddaddy of all codes, a plate's message that may only be visible when seen in a rearview mirror (think: "3MTA3"). "They'll try to spell it backwards, so the person in the mirror behind you can read it," said Barbara, a member of the DMV's Registration Special Processing Unit. The four-person team reviews 200-500 plates a day, including Internet submissions, she said. "It's really hard to say what would offend one person and not offend another person," said Barbara. "'IB6UB9,' would you like to explain that to your kid?" A few numbers are off limits for plates, such as 13, for its gang association. Fourteen and 88 are banned for their connection to white supremacists, said Barbara. The team uses search engines, Urban Dictionary, Wikipedia and Google Translation to help find dubious submissions. Between 20-40 plates a day are red-flagged for further inspection, said Barbara. That's when the plate gets sent higher up the chain for a focus group with Charlene's team. The DMV assembles six people with a "wide spectrum of ages and backgrounds and ethnicities," said Charlene, who also did not want her last name used. They're asked a simple question, said Charlene. "Would you find it offensive?" Depending on the group's answers, the plate is either OK'd, or a refund and denial letter are sent out. Drivers have an option to appeal, meaning it's sent back to another committee with between seven and 10 people on it, Charlene said. The DMV is open to interpretation. "'Ice' can be used for cocaine," said Barbara. "So if you're an ice machine repair man, you can send in pictures of your truck with the name of the company." About 5 percent of offenders get to keep their plates, according to the DMV. Barbara admits, "we're not perfect," and some questionable plates make it on the road. The DMV gets about 40 complaints per year. After three complaints, a plate is pulled without an appeal and a driver must take the DMV to court to keep the license plate. 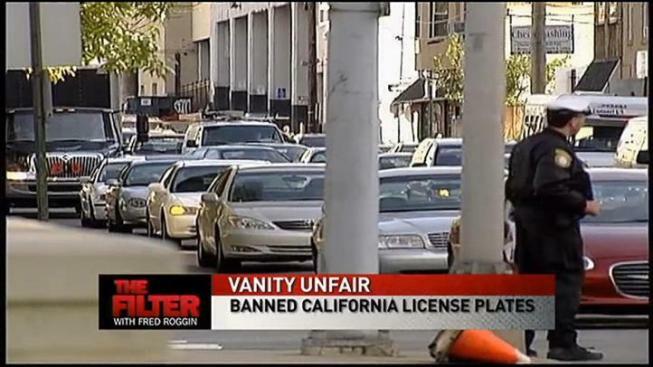 The California DMV sent us the following list of 100 banned license plates. The list was accumulated over a few years and has some obvious offenders. Others are a little trickier to decode. Warning: The following list contains offensive material.